Assistant Professor in International Business, School of Business, Aalto University, Finland. Deadline: 28 February 2018. Our group focuses on understanding the phenomenon of international business through multiple theoretical lenses and methodologies. We conduct research on strategy and organization of multinational corporations, people management, sustainability in international business, multilingual organizations, emerging markets such as Russia and China, international entrepreneurship and qualitative research methods. The International Business Group contributes to the Master’s Programmes in Management and International Business and CEMS Global Management. These programmes are designed to give students cutting-edge theoretical knowledge through a unique challenge-based learning experience. Our teaching assignments may also encompass undergraduate and PhD courses, and all courses are taught in English. 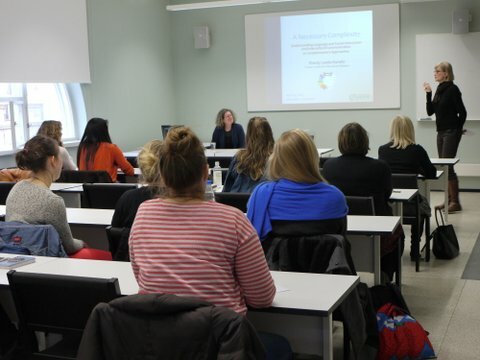 On April 23, 2013, I gave a talk entitled “A Necessary Complexity: Understanding Language and Social Interaction and Intercultural Communication as Complementary Approaches” at the University of Helsinki in Finland. My thanks to both Dr. Saila Poutiainen (at the University of Helsinki) and Dr. Leena Louhiala-Salminen (at Aalto University, and on the advisory board of this Center for Intercultural Dialogue) for serving as co-hosts, and to the Department of Communication at Aalto University for sponsoring the excellent dinner afterwards. On April 25, I was able to join the Corporate Communication Evening Seminar at Aalto University, co-sponsored by the Department of Communication and Aalto BIZ Corporate Relations, entitled “Multilingual and intercultural issues in Corporate Communication.” The presenters were Dr. Ulla Connor (Indiana University-Purdue University-Indianapolis) and Pia Friberg (Senior Manager, Wärtsilä Corporation). The former talked about intercultural rhetoric, and the latter described her own experiences with intercultural issues in a multinational corporation. I look forward to continued discussions with all these scholars. Anne Kankaanranta is Senior University Lecturer, Organizational Communication, Department of Management Studies, Aalto University School of Business (Aalto BIZ) in Helsinki, Finland. Her PhD is in Applied Linguistics (University of Jyväskylä, Finland). In addition, she has an MSc in Economics and Business Administration from the Vaasa School of Economics and an Executive MBA from the Helsinki School of Economics (since 1 Jan 2011 Aalto BIZ). Kankaanranta’s research interests focus on the concept of English as the business lingua franca (BELF) and global corporate communications. In particular, her interests include the concept of ‘corporate language’ in multinational organizations, Chinese-Finnish BELF communication and various aspects of intercultural communication. Her PhD focused on internal email communication in BELF in a Finland-based MNC. She has published in, e.g. Journal of Business Communication, Business Communication Quarterly, Public Relations Review, IEEE Transactions on Professional Communication, Journal of Business and Technical Communication, and English for Specific Purposes. She has worked as a researcher in two major research projects funded by the Academy of Finland. The first one examined communication and language use in newly merged Finnish-Swedish companies, and the second project investigated business and corporate communication as business know-how of internationally operating companies and organizations. Largely based on the findings of these projects, the School of Economics established new graduate programs in International Business Communication, which were later developed to the Master’s Program in Corporate Communication and the PhD Program in Organizational Communication. Currently Kankaanranta is involved in a study examining the competencies required for a profession in international corporate communication and a project on strategy communication in Finnish-Russian corporations. She has worked as a visiting researcher/lecturer in, for example, Centre for Global Englishes, University of Southampton (UK); School of Business and Social Sciences, Aarhus University (Denmark); Universitat Jaume I, Castellón (Spain) and University of Michigan (USA). Kankaanranta has been a member of the Association for Business Communication since 1996 and serves the organization on the Editorial Boards of both the International Journal of Business Communication and Business and Professional Communication Quarterly. Leena Louhiala-Salminen is Professor and Program Director of the Master’s Program in Corporate Communication at the Aalto University School of Business (AaltoBIZ) in Helsinki, Finland. Her PhD is in Applied Linguistics (University of Jyväskylä, Finland). In addition, she has a Licentiate degree in English philology (University of Jyväskylä), an MSc in Economics and Business Administration from the Helsinki School of Economics (current Aalto University School of Business) and studies in communication (University of Helsinki). Louhiala-Salminen’s main research interests include the various genres of business communication, the use of English as the business lingua franca, and corporate communication in international contexts. Her PhD focused on the notion of genre in business communication, with a particular emphasis on the generic qualities of the business fax. She has worked as researcher and project director in two major research projects funded by the Academy of Finland. The first one examined communication and language use in newly merged Finnish-Swedish companies, and the second project investigated business and corporate communication as business know-how of internationally operating companies and organizations. Currently Louhiala-Salminen is involved, for example, in a study examining ‘corporate language’ and communication of strategy in multinational enterprises operating in Europe. On the Advisory Board of the Center for Intercultural Dialogue, Louhiala-Salminen represents the Association for Business Communication (ABC). She is an ABC member since 1991 and has served the organization e.g. as member and chair of the Publications Board. In 2011 she was elected member of the ABC Board (Director at Large).